*Compatible with our infrared sunglasses & infrared contact lenses! *See every piece before you choose them! See your opponents pieces! 1. Just the marked Dominoes. This package is for people who already have some sort of Infrared device to use. 2. Marked Dominoes with Infrared Sunglasses. This package is if you want to use sunglasses to view the markings on the dominoes. 3. 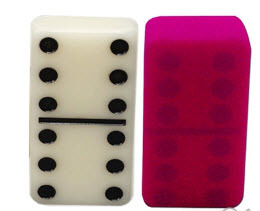 Marked Dominoes with Infrared Contact lenses. This package is if you want to stay discrete by using contact lenses for viewing the markings!